David really outdid himself tonight on the grill. Since moving in last year, we have only used our grill a handful of times and our primary cuisine has been burgers and steaks. Today though, David went outside of the ordinary and grilled us something truly extraordinary. I cannot recommend this dish enough! 1 dried ancho chile, 1 green pepper diced, 1 red pepper diced, 1 habanero pepper diced, 1 serrano pepper diced, 1 canned chipotle en adobo, 1 tablespoon rainbow peppercorns, 1 tablespoon black pepper, 1 teaspoon red pepper flakes, 1 teaspoon Chinese chili paste, 1 cup of water, 2 tablespoons salt, 1 tablespoon water. Toast the Ancho pepper by holding it in metal tongs directly over the oven flame (gas stove) turning it once or twice to ensure even cooking. Once pepper puffs slightly let sit to cool and de-stem it. Put the Ancho chile, red and green peppers, habanero, serrano, and chipotle peppers into food processor and pulse for a rough chop. Combine all other ingredients and put into two gallon ziploc bags (each bag will hold half of the rack of ribs & half of the brine). Cut the rack of ribs in half and put each into one gallon size ziploc bag with 1/2 of the brine each. Massage liquid to coat the meat. Let marinate in refrigerator for 6-12 hours. Remove ribs from brine and head to the grill. Discard brine. Heat up the grill. Brush grill grate with oil. Put ribs on the grill in indirect heat. Cover the grill and cook for 1hr. Check to make sure ribs are cooking at 350F. After the hour, brush one side of ribs with bbq sauce, turn, cover, and cook for 3 minutes. Repeat on opposite of ribs for another 3 minutes. 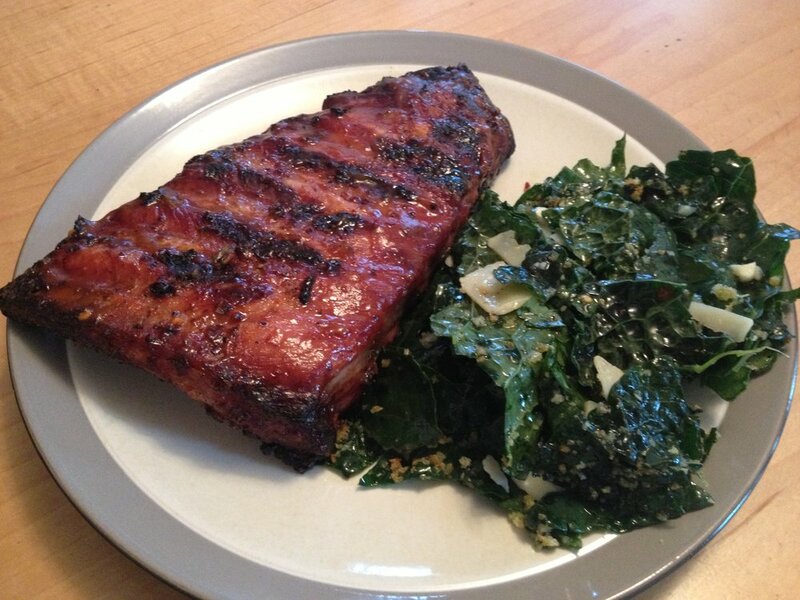 Remove ribs from heat and serve! ENJOY THEY ARE SOOOO GOOD!